For this week's Photoshop Contest, I want to spruce our old friend Santa up with technology. His sleigh only runs on what I assume is 8 horsepower, after all. Let's give him an upgrade. Your task is to upgrade Santa Claus with technology. 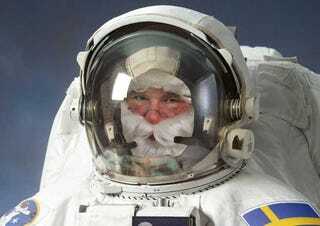 Come up with your best images and email them to me at contests@gizmodo.com with "Upgraded Santa" in the subject line. Save your images as JPGs, PNGs or GIFs, and save your files named as FirstnameLastname.jpg using the name you want to be credited with. On Tuesday, I'll go through the entries, pick three winners and then post the rest of the best in our Gallery of Champions. Get to it!